NASA Administrator Jim Bridenstine echoed and expanded on Pence’s message by stating, “This time, when we go to the Moon, we will stay. And then, we will use what we learn on the Moon to take the next giant leap—sending astronauts to Mars.” Bridenstine will speak on NASA’s implementation plans at the International Space Development Conference (isdc2019.nss.org) presented by National Space Society in June. 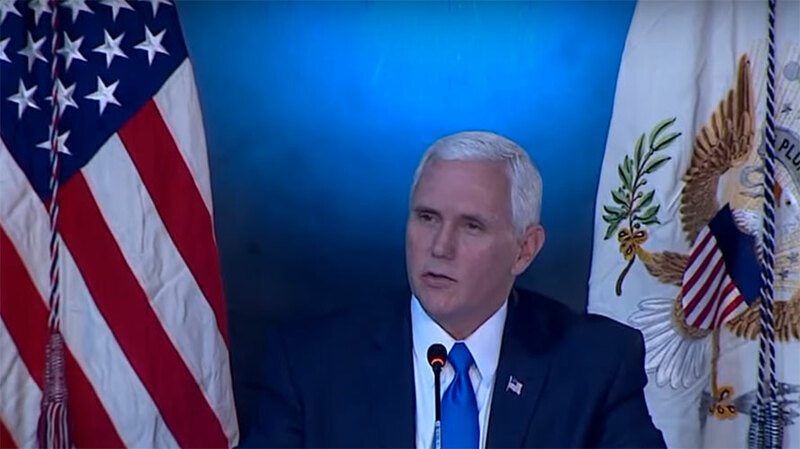 Image: Vice President Pence at the National Space Council meeting March 26, courtesy NASA TV. No Bucks, No Buck Rogers. I don’t think the private sector is prepared to put up the additional billions of dollar needed to greatly accelerate the schedule to return to the Moon. NASA’s share of the Federal budget at one-half of one percent is well short of the peak Apollo years of four percent, or even the average Apollo period (1962-1969) of three percent (https://en.wikipedia.org/wiki/Budget_of_NASA). Even counting advances in technology and lessons learned from the past, as well some direct money contributions from the private sector (e.g., private lander), NASA will need a lot more money to achieve this goal. At least five billion more per year, if not ten. Even with such an increase, NASA’s budget would still be below one percent of the Federal budget. Great well thought out idea! Must be something more than water ice in one or both polar regions of moon to support efforts on the moon and relay settlement or waystation to Mars Colonization.